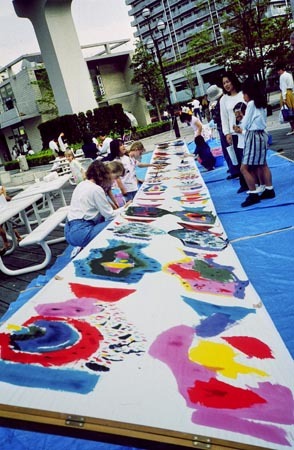 I started the Konobori Workshop when we opened my flag shop, EA, in Rokko Island in 1993. Since then it has become a customary event. Ten percent of the population of the town are American or European families, so this workshop is a great place of international friendship. I will be glad if my workshop helps create a new culture in this town on an artificial island. If you'd like to participate in this workshop, please email koinobori07@newsdust.com.